Shopping for plus size clothing is a tricky process, we can't just buy from any old store, and it often means limited options in more restricted sizes. So when programmes like Dispatches reveal the ugly truth behind our fast fashion, it brings up a whole new set of ethical questions. When even UK stores and factories aren't obeying the law and aren't paying their staff minimum wage, or treating them fairly, what can we as plus size women do to try and shop ethically? I tweeted about some of our options, especially as fashion bloggers, but I wanted to compile them into a blog post with more info too. 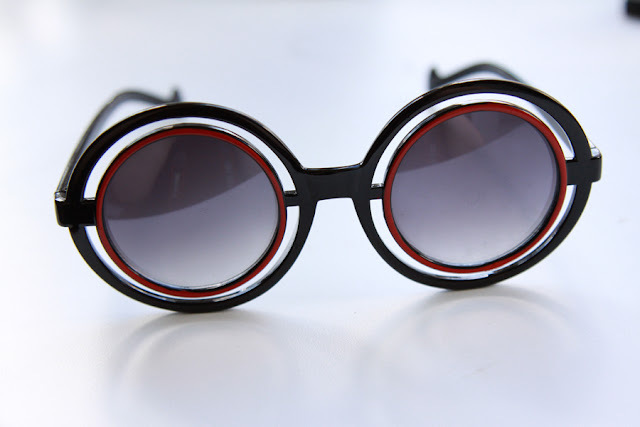 I bought these vintage sunglasses second hand on Depop. This isn't the easiest option for a plus size body, second hand and thrift shops tend to not be an option, but the likes of Ebay and Depop are. You can filter by size, and Ebay launched their Curve Hub last year to promote their plus size section. There are also plus size fashion Facebook groups dedicated to selling clothing, so you can really grab some bargains and show a previously unloved item some love! You can also use these sites to sell on your own pieces that you didn't wear as often as you might have wanted to, or if you can afford to, donate them to charity shops in your local area. Being plus size can bring with it economic prejudices, so any second hand bargains can be a life saver for a plus size babe on a budget. Be proud that you got yourself a second hand steal and tell everyone how/where you got it! I cut the sleeves off and covered this old jacket in pins when I realised I owned two identical jackets in slightly different colours. I wear this way more now! 2) Customise what you already own. So many of us own clothes that we just don't wear, but don't like quite enough to wear. Give your wardrobe a new lease of life by customising what you already own. I've tie dyed dresses, cut the sleeves off old denim jackets and covered them in patches, cut up old band t shirts to make them cuter and more. There are so many different ways to update your clothes in relatively simple ways. Iron on patches and pins are easy and cheap ways to bring something up to date and on trend. 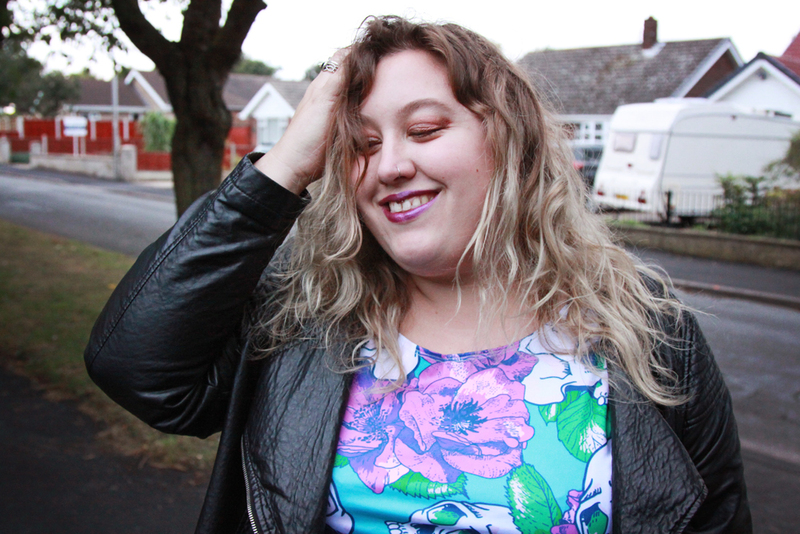 Zoe from IKIWN has written a few articles for She Might Be on how to customise old clothing, including updating an old winter coat and a way to try out the embroidery trend with what you already own. This tutu* and flower crown* are from Tutu Factory! When it seems that companies don't even know how their factories and sub-contractors are operating or treating their staff, buying from independent and small businesses can be a much better option. Small businesses need our support, and when you are buying from a one person business or a very small team, you can generally feel more comfortable in knowing that they are being paid a fairer wage. There are so many amazing indy brands out there producing incredible clothing in inclusive sizes, it's just a matter of knowing where to find them! 4) Rewear what you already own. Now this one is for bloggers more than anyone else. We're all guilty of wanting to show off our new finds, or only wear things once on our blogs, but let's be real, that's not how life works! Take the pleather jacket in the photo above, I have worn that a couple of times a week, for a couple of years now. I've also shared it on my blog a good ten times. I used to feel a bit of a sham as a fashion blogger for sharing the same pieces over and over again, but that's reality, that's how we really dress, so it's honest and right to share that too. 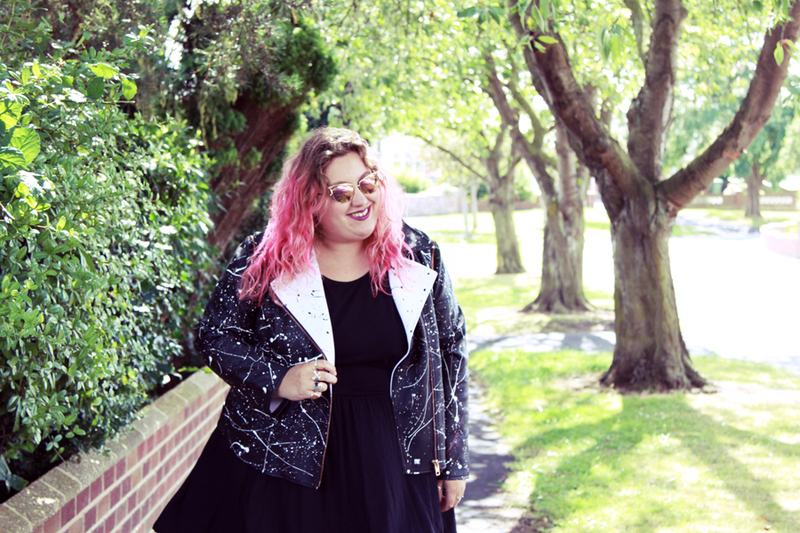 We aren't all wearing pieces from the ASOS New In section every day, we're wearing the jacket we love over and over again, so share it on your blog again, and show how you'd style it with something else. Upcycled vintage pleather jacket from Plus Equals. 5) Go through your wardrobe every season. It can be easy to forget what clothes you have buried in the back of your wardrobe from season to season, so go through it as the weather changes and reassess what you own. You might have forgotten the cutest dress, or think you need a new winter coat, when really there is one you didn't remember you had buried in the deep dark depths of your wardrobe. I try to go through my wardrobe 4 times a year, and what I'm not going to wear I donate to charity, and I almost always find some old treasure I didn't realise I still owned. Find hidden goodies that you already own, a free new wardrobe in your size too! If you have any other tips, please do share them! Plus size shopping can be hard enough without the guilt of never knowing if the person who made, packed or shipped your clothes has been paid fairly too. Once you are shopping for size 24+ clothing it becomes a whole different ball game. Do what you can when you can, but don't beat yourself up over the new purchase you had to make. 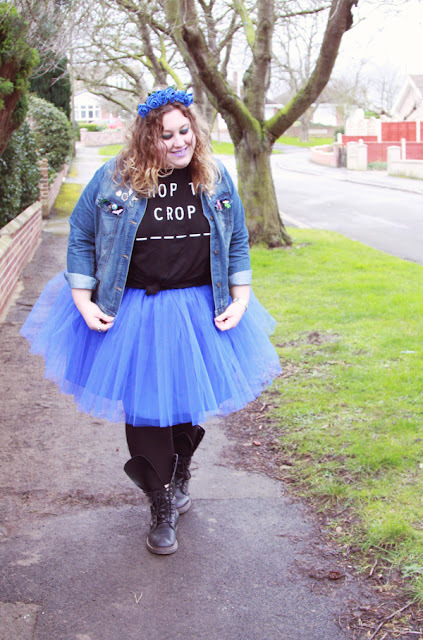 Plus size shopping is a difficult thing at the best of times, and being able to buy clothing second hand in your size can be a privilege that the higher end of the plus size spectrum don't have. Do your part when you can and together we have to keep pushing retailers to be more ethical. Great tips Kitty - love it! I've recently started customising a few of my clothes, I love how it gives me a 'brand new' piece of clothing for no cost!